Home » Featured Home » MBA Recruiters: What Does General Mills Want From Business School Students? You have probably eaten a General Mills product at some point. The maker of Cheerios, Nature Valley, Betty Crocker, Yoplait, Annie’s Homegrown, and Old El Paso products operates in more than 100 countries, producing and marketing more than 100 consumer brands. But it may surprise you knowing that an MBA can directly link you to a General Mills career. The company’s roots date back to the Minneapolis Milling Company, founded in 1856, but General Mills itself was created in June 1928. The business really took off in the early part of the 20th century, as it pioneered marketing and sponsorship strategy, such as introducing redeemable box top coupons. The popular program lasted from 1929 until 2006. General Mills pivoted in a number of directions throughout its history, dabbling in other retail products like toys and clothing. In more recent years, the company has expanded its healthy food options, such as its 2014 acquisition of organic food producer Annie’s Inc. for around $820 million. The company is currently focused on five global growth platforms: cereal; snacks; yogurt; convenient meals; and premium ice cream. In 2017, General Mills’ net sales totaled $15.6 billion, with its five major platforms accounting for around 75 percent of the total. General Mills also implemented a new global organization strategy in 2017, reorganizing into four major operating groups: North American Retail; Convenience Stores & Food Service; Europe & Australia; and Asia & Latin America. North American Retail makes up around 64 percent of the net sales. In 2017, General Mills ranked as one of the top 20 companies in the United States. New job opportunities are available in several departments, such as corporate, engineering, finance, IT, food safety, research & development, supply chain, and more. In addition, the company also has internship opportunities for students. General Mills offers comprehensive medical and dental benefits to non-union, U.S. employees, and eligible dependents. According to the company, employees are automatically enrolled in company-paid benefits including life insurance, business travel accident insurance, short and long-term disability, and financial coaching programs at no cost. General Mills also offers retirement benefits, including a 401(K) + Savings program, in addition to vacation, company-paid holidays, flexible work arrangements, and leave benefits for all life stages. These include (as of 2019) 18-20 weeks paid maternity leave and 12 weeks paid parental (fathers, partners, adoptive parents) leave. According to PayScale, employees earn an average of $74,786 a year at the company. 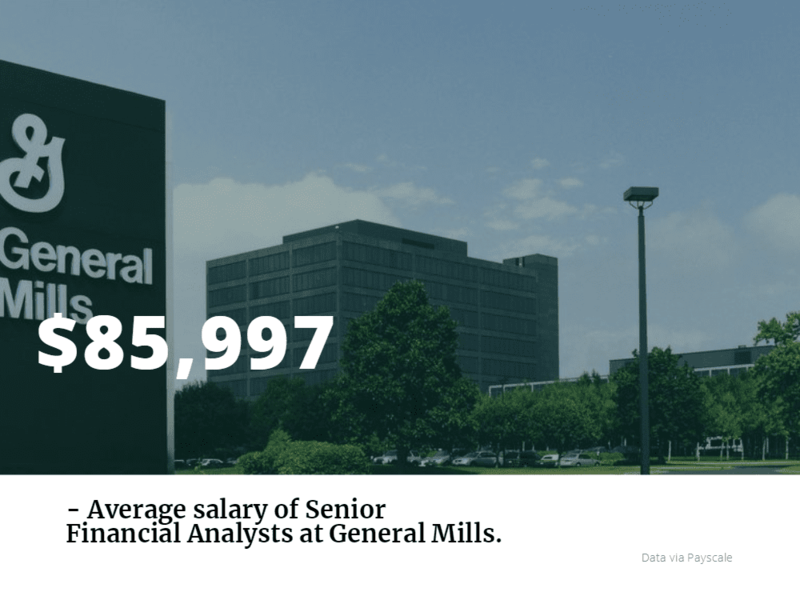 General Mills career salaries range from an average of $48,107 to $114,448 a year. Jobs that MBAs may be interested in have salaries on the higher end, such as Senior Financial Analysts ($85,997 per year) and Associate Marketing Managers ($106,000 per year). General Mills is an active campus recruiter, offering full-time opportunities and internships for current students. Opportunities are offered across the U.S., including the company’s Minneapolis corporate headquarters. According to General Mills, recruiters visit many campuses and attends several large national conferences throughout the year. A list of upcoming campus events can be seen here. Students accepted into internship programs interact with senior leaders at the company, build professional networks, and create lasting relationships. Internships are available in all areas of our business, from sourcing to manufacturing to brand marketing. Each program is 10 weeks long, occurring in early June to mid-August. Recruiting begins the fall before students start their internship. For example, General Mills is looking for new Associate Marketing Manager Interns in Minneapolis. The program develops and trains MBAs for management positions at General Mills through in-role immersions, formal training, and management coaching. Assignments can include experiences such as established brands, innovation/new products, and customer/channel. The program is for currents MBAs or graduates with marketing and/or general management concentration.